There we go! 10 books that I could totally read, re-read, and then re-read again! What 10 would you chose? Can we only pick one book??? Cause I have quite a few! I'm an old follower. Just stopping on by. The Hunger Games and The Mortal Instruments would've definitely gone on my list but I already had Harry Potter and I thought one long series was enough! This week's question was so hard! I'm an old follower popping by. I think I really need to read the Hunger Games! This week was a hard one. Have a great weekend and happy reading! When making my list, I just ignored the fact that series are multiple books. I live in my world and that's how I do it. I haven't finished the Hunger Games series, but it makes me want to get with it faster. I really wish I had added Pride and Prejudice too! Seems like you didn't have it too tough! I seriously aren't done with my list. Just noticed I forgot a few series. Sigh! Way to hard for me, lol. I LOVE the Wake series!! Great selection! Truly wish we could pick 10 series instead of 10 books alone! It would make life so much easier! Great list! I would keep some of the same ones. It was hard as I would want to save them all! Wow! great list of books,enjoy them. Hey Christie, just stopping by on the follow. You have good taste. 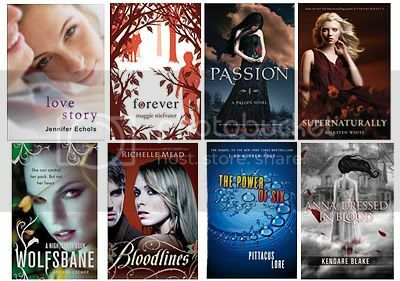 Yay for Bloodlines and Wolfsbane! New follower here, although not a new reader. I'm still thinking about which books I'd bring - that's almost asking me which of my kitties I'd choose to bring over the others. Great picks for your ten books to take. I can't wait for your summer choices either. There are so many fixin' to come out, I don't know what to choose first when they do. I think that my most anticipated on of the summer is Forever. I really would love to know how it all ends. I hope that you have a great weekend and I am glad to see that you are ok from the storms! Stopping by from Follow Friday. Great book choices.I'm need to read The Hunger Games as it's showing up on a lot of listes. Wow...lots of books....I need to check out new ones.